Historically, the origin of Pu-erh tea dates back to the Eastern Han Dynasty during the period 25 to 220 CE in Yunnan where the leaves were sun-dried. The region’s tea plants had big but tender leaves with hardy stems. 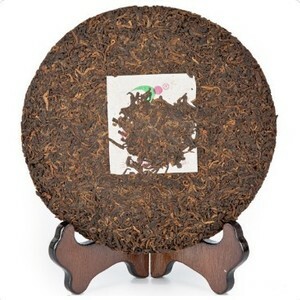 At present, Pu-erh tea that have big and wild leaves are considered valuable. As far back as the 7th century, the export of compressed, vintage green Pu-erh Tea has been around. As it does not spoil during travel due to various fermentation processes and their compressed weight, Pu-erh tea was an ideal tea product for export. It was also discovered that its taste became even better when aged so the practice of storing Pu-erh tea became popular. People from neighboring areas such as Guangdong whose diets consisted mainly of beef, vegetables and seafood discovered that drinking Pu-erh tea was good for better digestion especially of oily foods and were effective supplements of vitamins and minerals which were missing from their regular diet. The affordability of Pu-erh tea heightened their use of Pu-erh tea which they still practice up to this day. A scholar by the name of Fan Cheuk from the Tang Dynasty in 862 CE went on a mission representing the Emperor to parts of China in the west, particularly Yunnan. In his writings in a book titled Meng Shu (“Book of Uncivilized Peoples”), he related that in the mountains surrounding Yin-Sheng, the locals had no modern methods of picking tea and cooked tea with spices like ginger, pepper, and drank the tea with milk. This fact may have seemed outrageous to the more sophisticated royal court who was used to maidens picking tea leaves with gold cutting implements and carefully chose only the tenderest buds. During the Ming Dynasty, sometime in 1391, the Ming Emperor banned the use of all tea that were shaped like the moon and those that have been compressed because he thought its production wasted too much of the people’s time. Loose leaves of tea was the only kind allowed then. Zhao Yuan, a scholar, wrote that everyone regardless of social class was consuming Pu Cha tea as a beverage. Emperors were believed to have been drinking Pu-erh from the early days for long life and particularly appreciated its taste since it was made only from the finest tea tips and buds. At the time of the Qing Dynasty, Pu-Erh tea originating from the region of Simao, Yunnan province, was declared a tea of tribute by Emperor Yongzheng . In what became a customary tribute, tea regions to produce the tea to be offered as a gift to the royal court were chosen personally by the Emperor. This was then considered a great privilege and was good for the local economy. Emperor Fu Yi of the Qing Dynasty is said to have ordered peole to drink green tea during summer and pu-erh in winter. The custom of drinking Pu-Erh Tea in those days was like being part of the Emperor’s household. British and French authorities established customs in Simao in 1879 to aid their never-ending pursuit of black tea. Discovery of the remnants of the historically renowned Pu-erh Tea Horse Roads on which tea travelled across Asia carried by horses in caravans was named a cultural heritage.